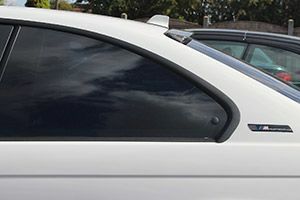 Available choice of 4 tints, we are able to provide film and application for your vehicle. Classed as Light Smoke, Smoke, Midnight and Limo – these tints offer up to 50-95%. Not only is it a great way to transform the look of your vehicle, it also is a great protector of the sun’s UV and heat. Highly recommended for vehicles with black leather interior, tinting helps to keep your car cooler in the summer months. If you would like more info or to book in for our window tinting service, call us on 0208 598 9115.